© FarmgirlFare.com, the scrutinized foodie farm blog where Topaz, who spent 15 months at the animal shelter before we adopted her last December (along with Sarah Kate and Mr. Midnight), decided to move outdoors and is loving her new life as a farm cat. She even rode around the farmyard on the hay trailer before I snapped this picture. Oh yeah, and I lied — a brief explanation of the whole haying process will accompany the next photo, not this one. Plus I still need to get you caught up with the rapidly growing livestock guardian puppies (yes, they finally both have names! ), the new bread bakery building, and some other stuff I'm forgetting at the moment. There are more recipes to share and lots of wonderful new cookbooks to give away, too. Sheesh. How did I get so far behind? It's been almost a week since the last Daily Dose of Cute. And you haven't even met Sylvester the cat — or the cows! At least we had cake and cookies. That makes everything better, right? © Copyright 2008 FarmgirlFare.com, the award-winning blog where the next photo will include a brief explanation of the haying process for those of you who have been wondering about it — and then the hay photos will be over for a while (for those of you who have been wondering if they were ever going to end, which is pretty much how it feels during haying season). When it comes to basil, purple is the new green. Got (or want) basil in your garden? You'll find links to all of my basil growing posts, as well as more of my favorite basil recipes, at the end of this post. 2011 Update: Farmgirl Fare readers offer up even more ways to use fresh basil here. I have no idea how it happened, but spring 2007 found me and my kitchen garden completely basilless. Thankfully a gardening friend—whose tiny city garden I usually supply with plants—was kind enough to share a couple of basil seedlings with me, including a purple one. I'm not very adventurous when it comes to herbs, and I'd never grown purple basil, but begging gardeners can't be choosers so I gratefully took what he offered and stuck it in the ground. The purple basil plant flourished. It was gorgeous, but I didn't know what to do with it. I love fresh basil in all kinds of dishes, and I loved the color of these leaves, especially how they're outlined in green, but the thought of blackish purple basil pesto—or blackish purple basil anything for that matter—just didn't seem appealing. My dear friend Kat, who writes the scrumptious blog, She's In The Kitchen, suggested I make basil vinegar with it: You fill a large jar with half white vinegar, half cider vinegar, stuff it with purple basil, and let it steep for a week. Then you strain it and pour the resulting gorgeous magenta vinegar into a pretty bottle with a few sprigs of fresh basil. That sounded nice, but I wasn't sure what I would do with the vinegar either. First harvest of the 2011 season: a pound of Red Rubin basil from three plants. Soilman in England suggested I put it in Mussels à l'Italienne and even offered up his recipe: Chopped onions sweated in olive oil for a few minutes. Add a few glugs of white wine and lots of chopped tomatoes plus tomato purée. Pour your mussels (cleaned and de-bearded) in, cover and cook for 5-10 minutes. Put into bowls with lots of chopped purple basil. I couldn't wait to tell my city friend that I'd figured out what we could do with our purple basil. He listened patiently with a slight smile on his face as I recounted all these creative ideas. Then he said, "I turned mine into pesto." "It was the best basil pesto I've ever had." "It was like pesto on steroids." "And it wasn't even that weird of a color." So I skipped all the wonderful suggestions and turned my entire purple basil plant into the best pesto I've ever tasted instead. This lower fat, reduced calorie pesto, which calls for less olive oil than most recipes, is bursting with freshly picked garden flavor. The tomatoes are a healthy way to replace some of the olive oil while adding a subtle new flavor. When portioning out basil (and so many other ingredients), it works best if you weigh it rather than pack it into measuring cups. A digital kitchen scale is a worthwhile and useful investment, and once you have one you may wonder how you ever lived without it. I often use my Oxo 11-pound kitchen scale several times a day. The pull-out display is awesome, and it's also great for weighing outgoing packages. Don't have any purple basil? Just use green instead! In the bowl of a food processor use the S-blade to whiz the almonds and garlic until finely chopped. Add the basil, cheese, tomatoes, and salt, and process until thoroughly combined and the consistency you like. With the motor running running, slowly drizzle the olive oil through the chute. Add more salt to taste if desired. Store your pesto in the refrigerator for several days or freeze. Except for the fact that purple basil isn't as pretty as the green and does make a rather oddly colored pesto (as you can see in the photo above), I would probably quit growing the green stuff altogether. Mixing a few green leaves into the pesto does help brighten it up a bit. Unfortunately my friend couldn't remember what kind of purple basil we were growing, so I figure I'll just work my way through every purple variety I can find and do some scientific taste comparisons. 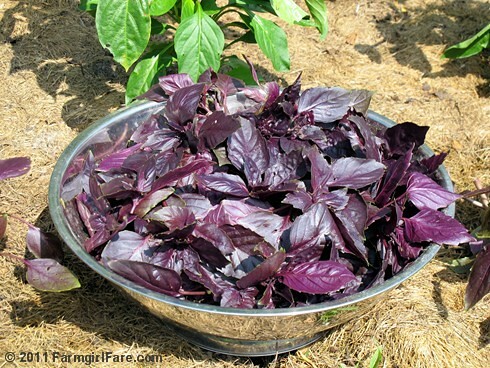 There are even certain types of basil plants that are half purple and half green. I didn't forget to plant basil seeds this year, though I did get a rather late start. Five different types of basil, including Purple Ruffles and Purple Osmin, plus a mixed variety surprise pack are just now sprouting in little containers, but I have high hopes for a bumper summer crop. (And besides, my tomatoes won't be ready for ages either.) 2011 Update: I had really good luck growing Red Rubin basil (see photo above). I might even turn part of my purple basil harvest into something other than pesto. But don't hold your breath, especially since I've discovered such a delicious way to use it. Opening a bag of cheez doodles and pouring them into a bowl would probably be a slightly easier appetizer to make than this, but they wouldn't taste nearly as good - or be as good for you. This stuff isn't exactly beautiful, but trust me when I say that no one will notice. The consistency of this spread will vary depending on the type of beans you use, how well you drain them after rinsing, and the thickness of your pesto. I made one batch with Great Northern beans and a slightly thinner pesto and ended up with a dip rather than a spread. If it's too thick for your liking, simply thin it out with a little olive oil or water. Cans of organic beans are an organic bargain and a handy staple in my farmhouse pantry; I buy them by the case. I really like Eden Organic brand beans, which are organically grown in the U.S.A. on family farms, have no salt added (I prefer to add my own), and are packed in BPA-free cans. Combine beans, pesto, and cheese in the bowl of a food processor fitted with the 'S' blade and whiz until smooth. Salt to taste. Serve with pita chips (check out my easy recipes for homemade pita chips and pita bread, plus easy pita pizzas), crackers, raw veggies, or a spoon. This spread improves with age, so try to make it a day ahead. Of course then you'll also have to try not to gobble it all up before serving time comes, but fortunately the recipe can easily be doubled. After coming up with this recipe while my foodie mom was visiting last fall, I've become slightly obsessed with white bean dips. Sometimes I even have them as a main course (because I eat so much I don't have any room left for the actual main course). It turns out that almost anything can be successfully mixed with a can of white beans (where have I been? ), and I'll be sharing some of my other favorite creations soon. 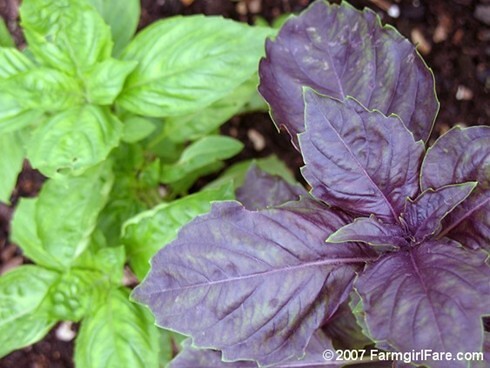 © FarmgirlFare.com, where there can never be too much fresh basil, no matter what the color. © Copyright 2008 FarmgirlFare.com, the award-winning blog where the most important thing we learned during haying season this year is that you always need to double check the shear bolts (and anything else) the kid at the local hardware store picks out for you, because returning the ones that are the wrong size makes for an hour of driving, a lot of frustration, and some very expensive bolts considering the price of gas these days. But thanks to my hunky farmguy's masterful skills with duct tape, at least baling operations didn't have to shut down during the mad dash back to town. 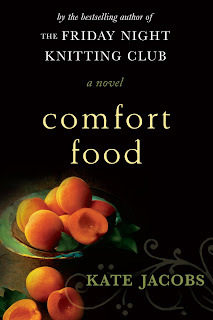 Book Giveaway: Win a Copy of Comfort Food by Kate Jacobs — and a Nifty Totebag! When my copy arrived, I was surprised to discover that Comfort Food is actually a novel, and not a memoir as I had for some reason thought. I was hooked from the first paragraph — which mentions five kinds of birthday cake — and stayed up way past my bedtime that night reading. This is the kind of book you want to both devour and savor, and after I finished the last page I was tempted to turn right back to the beginning and start all over so I could keep hanging out with the characters. When I saw the unabridged audio version at the library the other day (I'm addicted to audio books!) I immediately snapped it up - and was doubly delighted to discover that it's read by Barbara Rosenblat, one of my favorite recording artists. The book is just as delicious the second time around. Kate Jacobs' first novel was the runaway bestseller The Friday Night Knitting Club, which I'm looking forward to reading. (Have you read it?) Kate says that Comfort Food is about "food, family, friendships, and overcoming frustrations," and that's all I'm going to tell you except that the book made me laugh, cry — and hungry. If you get annoyed when the characters in novels continually go out to eat but the author never lets you know what they order (or they never seem to eat at all!) then you're going to love this book. It revolves entirely around food. The characters don't just go to the farmers' market — they discuss what they could do with all the fresh bounty while they're there. Gus, the main character, "loved to talk about food. Late at night, if she couldn't sleep, she would read cookbooks out loud to herself until she relaxed." Ready for more than a taste? I have two hardcover copies of Comfort Food to give away, and each of them comes with a special bonus - a handy dandy canvas totebag emblazoned with the gorgeous book cover art. It's the perfect size for packing your groceries, goodies from the farmers' market, or practically anything else. I use mine constantly. Just leave a comment in this post between now and next Thursday, July 3rd, and tell us about your favorite comfort foods. I'll randomly pick two winners and announce them a day or two (or three or four) after that. Sorry, but the books can only be shipped to U.S. addresses. I can't wait to see your comments. And if you're like me and love to read about what other people eat, check out my Alone in the Kitchen with an Eggplant book review post from last year, where dozens of readers revealed what they secretly eat when they're all alone in the kitchen. If you haven't contributed yet, please feel free to add to the wonderful list. * I've decided this isn't something I'm going to pursue now, but I sure was thrilled to be asked! © Copyright 2008 FarmgirlFare.com, the award-winning blog where we never get tired of reading or eating - and prefer to do them simultaneously. © Copyright 2008 FarmgirlFare.com, the award-winning blog where the daily cuteness hasn't stopped, just slowed down in the heat — and most of us around here feel like sprawling under a nice big shade tree (or in front of an air conditioner!) and doing a bit of 'growing' ourselves (for about the next three months). These giant cookies are a hit with both kids and adults. Before I became a farmgirl in rural Missouri, I was (among other things) a graphic designer in urban Nortnern California. I had a collection of Rapidograph pens and subscribed to magazines with names like Communication Arts and Print. Now I collect pitchforks and rocks and read Progressive Farmer and the quarterly bulletins put out by the USDA. I've also forgotten nearly everything I once knew about photo screens, acetate overlays, paste-up boards, and type indication (just coming up with this list was a challenge), but fortunately all that stuff is pretty much obsolete anyway. So much for my college education. One thing I do remember after all these years is an article where a bunch of designers was asked what they thought was the most well designed food, and somebody said bananas. Yes! Bananas come with their own handy packaging so they transport well and you don't have to worry about washing them before eating—which you can easily do one-handed. And, unlike oranges, they aren't messy and therefore don't require a napkin. Bananas also happen to be one of the World's Healthiest Foods, and are packed with vitamin B6, vitamin C, manganese, and fiber. According to the WHFoods website, they're one of our best sources of potassium—an essential mineral for maintaining normal blood pressure and heart function—and can help do everything from build better bones to protect your eyesight. They also happen to be inexpensive, plentiful, and delicious. Carrying around a healthy, protected snack is all well and good, but everybody knows the best way to enjoy a banana is after it's been baked into something like muffins or cookies or cake. The key to baking with bananas is to let them get really, really ripe — more ripe than you've probably had the nerve to let your bananas get. I don't mean yellow with a few dark spots; I'm talking blackened skins with insides that have turned to mush. A little mold on the outside is even okay. Sure they look disgusting, but you won't believe the amazingly sweet banana flavor they'll give your baked goods. And guess what? Research conducted at the University of Innsbruck in Austria suggests that as fruits fully ripen, "almost to the point of spoilage," their antioxidant levels actually increase! Organic bananas can now be found in many supermarkets, and they usually don't cost much more than the conventional ones. I find that organic bananas taste better, and of course they're better for your health, farm workers' health, and the environment. After harvest, bunches of conventional bananas are floated in tanks of sodium hydrochlorate solution to dissolve the drips of latex sap that can discolor the fruit. Experiments have shown that fungicide-treated bananas can develop off-flavors. Yet "hands" of bananas (the small bunches we see in markets) are conventionally treated with fungicides by being placed in polyethylene bags with blocks of vermiculite treated with potassium permanganate to absorb the ethylene ripening gas that bananas give off. This allows the bananas to be stored and shipped over a month's time before they start ripening. And that's just what happens after they leave the soil-destroying, chemical laden, disease- and fungus-ridden plantations. Yet according to Cox, when bananas are under organic cultivation "the soil improves in health, amount of soil life, availability of nutrients, resistance to soil pests and diseases, and its ability to produce extra high quality bananas and plantains." Seems like a no-brainer to me. Unfortunately locally grown bananas aren't an option for most of us, but if you choose to buy imported bananas, the organic ones are well worth seeking out. When you find some, buy an extra bunch to ripen on the counter (if you put them in the fridge they'll make everything else in there taste like bananas) and when they start to look really scary, whip up a batch of these flavorful, cake-like cookies. Say it with me now: Yip Yap Banana Snaps! Last fall I was thrilled to see that Tania had started posting again on her Canadian food blog, The Candied Quince. One of the first recipes she put up was for Yip Yap Banana Snaps dog treats in honor of her little dog's third birthday, admitting she chose them because she liked saying the name. The name hooked me, too, and I immediately decided I needed to make some for my own dogs. But then I saw the recipe for Garrett's Grandma Capune's Banana Cookies on Vanilla Garlic, and making treats for people quickly won out over making treats for dogs (I know, I know, animal abuse). The name Yip Yap Banana Snaps, however, stuck. In fact I couldn't stop saying it. One night I crawled back into bed after getting up for a drink of water and excitedly announced to an only slightly coherent Joe, "I don't want to build a bread bakery anymore. I think we should sell Yip Yap Banana Snaps instead!" I pretty much followed Grandma Capune's recipe the first time I made these, then I doubled the recipe so I could make my signature giant size cookies and started making various other changes, including adding a little vanilla, swapping out half of the all-purpose flour for white whole wheat flour, and using a mixture of white and brown sugars instead of just white. They aren't health food, but they aren't terrible for you either. You can make these cookies with raisins or chocolate chips and/or nuts or with nothing but the spices. Joe loves the raisin version; I like them with mini chocolate chips the best. As always I urge you to use local and organic ingredients whenever you can. Heat the oven to 350F. Using an electric mixer (I use a hand-held mixer), cream the butter and sugars in a large bowl until light and fluffy, about 1 to 2 minutes. Add the eggs and beat until well combined. Beat in the vanilla. Combine the baking soda and mashed bananas in a small bowl and let sit for 2 minutes to froth a bit. According to Grandma Capune and Garrett, the baking soda reacts with the acid in the bananas to give the cookies their lift and rise. Mix the bananas into the butter mixture, then add the flours, cinnamon, nutmeg, cloves, and salt and mix on low speed just until combined. The batter will be more like a thick cake batter than traditional cookie dough. Stir in the raisins, chocolate chips, and/or nuts. Use a 1/4-cup scoop or 1/4-cup measure to drop cookies onto a heavy duty baking sheet lined with unbleached parchment paper. I can fit 6 cookies on one half-size commercial rimmed sheet pan. If the batter gets too gooey to handle, put it in the freezer for a few minutes to stiffen up. Bake cookies until nicely browned, about 16 to 20 minutes. Cool on a wire rack. Store in an airtight container or freeze. I think they taste even better the next day, after the flavors have had a chance to mellow and mingle. © 2008 FarmgirlFare.com, the sweet-toothed blog where it was recently decided by unanimous vote that the ratio of cute animal photos to scrumptious dessert recipes is far too high, and have set about remedying the situation. 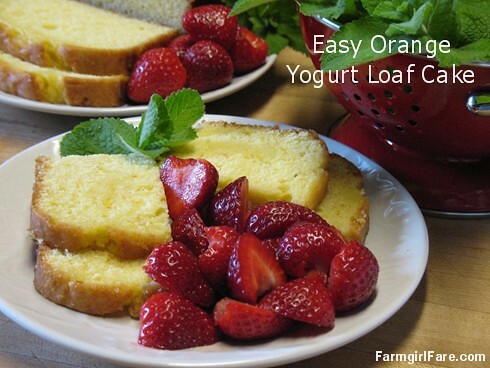 A simple, not overly sweet orange loaf cake that tastes great with strawberries and stays moist for several days. Last year I filled one of the 4' x 8' raised beds in my kitchen garden with 30 Cavendish strawberry plants, and after diligently snipping off every blossom and runner that appeared during the summer (because no berries the first year means bigger and healthier plants the next), nestling the plants under a protective bed of hay in fall, dreaming of glistening strawberries throughout the winter, and happily monitoring the flourishing plants come spring, I was finally rewarded with a juicy and jewel-like harvest that began the end of May. I savored the first strawberries of the season while standing in the garden, and it doesn't get much better than that—unless you happen to have a nice orange yogurt cake, some freshly whipped cream, or a scoop of French vanilla ice cream (or all three!) handy. A slice of this moist, not overly sweet cake is delicious by itself, but it goes particularly well with strawberries, and it also tastes divine with blueberries. Sadly, most strawberries today don't even taste like strawberries. They've been manipulated and modified to look big and pretty and travel well, with flavor barely a consideration. In order to find a good strawberry you must look to your own or a generous friend's garden, a small U-Pick farm, or a farmers' market. And organically grown is a must. Commercially grown strawberries are #2 on the Environmental Working Groups list of most contaminated produce (apples are #1), and years ago I read that in one laboratory test a single commercially cultivated strawberry was found to contain residue from 22 different toxic chemicals. That's so sad it doesn't even seem possible. Oranges are #31 on EWG's list, and since the skin of citrus fruits often contains lots of toxic chemical residues, it's best to seek out organic fruits when using the zest in recipes. Freshly picked strawberries with a side of homemade cake for breakfast. This is the kind of simple recipe I love to have in my collection. It mixes up quickly, can be eaten plain or gussied up, and stays moist for several days. Like most baked goods it also freezes beautifully—and can be easily sliced when frozen. It tastes even better the second day. One of the nicest things about cake recipes is that there are basically an endless number of them; change one or two things and you'll often end up with an entirely different dessert. You could certainly make a lemon version of this, and I'm thinking about a combination of lemon and lime, or maybe even lemon, lime, and orange. 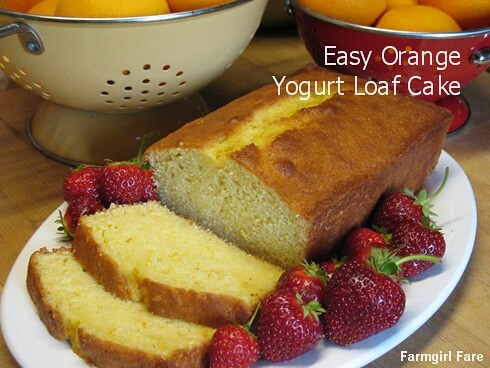 A Meyer lemon yogurt cake would probably be delightful. As always, I urge you to seek out local and organic ingredients; they really do make a difference. Good baking pans make all the difference. I love my Chicago Metallic 10-inch commercial loaf pans and my heavy gauge 9"x5" USA Pan. Both pans are also great for baking sandwich breads, such as my popular Farmhouse White. 2. Place the butter and sugar in a large bowl and use an electric mixer (I use a hand held mixer) to cream until light and fluffy, 1 to 2 minutes. 3. Add the eggs, vanilla, yogurt, orange juice, and orange zest and beat 1 minute. 4. Add the flour, baking powder, baking soda, and salt and mix well. 5. Pour the batter into a greased and floured 9"x5" or 10"x5" loaf pan and bake for 55 to 60 minutes, or until a toothpick inserted near the center comes out clean. Ovens vary, so start checking for doneness after about 45 minutes. Let the cake cool on a wire rack for 10 to 15 minutes and then carefully remove it from the pan. 6. If desired, combine the orange juice and sugar and stir until the sugar dissolves, then spoon or brush it over the cake. Slice and serve, preferably the next day if you can wait that long, plain or piled high with fresh strawberries and whipped cream and/or ice cream. This cake will keep at room temperature for 3 days or can be frozen. Garden Journal 5/28/08: Successfully Growing Strawberries! Still hungry? You'll find links to all my sweet & savory Less Fuss, More Flavor recipes in the Farmgirl Fare Recipe Index. Enjoy! © FarmgirlFare.com, the sweet and juicy foodie farm blog where Farmgirl Susan shares recipes, stories, & photos from her crazy country life on 240 remote Missouri acres—and every freshly picked berry is a cause for celebration (and cake). Want to see more haying photos? © Copyright 2008 FarmgirlFare.com, the award-winning blog where as soon as the Four Hour Parisian Daily Baguettes are finished baking (they smell so good!) I'm headed back out to help pick up bales - then we'll be out of the hay and hopefully I'll have time to share a bunch of tasty new recipes that have been piling up, including three simple and refreshing vegetable salads, my new favorite orange loaf cake, and the easiest white bean appetizer spread ever. © Copyright 2008 FarmgirlFare.com, the award-winning blog where we couldn't decide which was cuter, yesterday's photo of Dinky or this one (which was also taken last September), so we decided to simply post them both. Need to see more cute? © Copyright 2008 FarmgirlFare.com, the award-winning blog where we've been discovering some forgotten and never shared favorite photos while sorting through (and somehow trying to organize) about a zillion of them (yep, somebody's hard drive is ridiculously full). © Copyright 2008 FarmgirlFare.com, the award-winning blog where we're wondering if it really is possible to sweat to death in June, but are comforted by the thought that if we survive after summer it'll be fall — and Daphne just keeps getting more pregnant. © Copyright 2008 FarmgirlFare.com, the award-winning blog where we don't wear many baubles these days, yet we're surrounded by precious gems — and we keep seeing a cow in the top photo and a stingray in the second one. What do you get when you have a greenhouse full of Swiss chard, a bumper crop of scallions in the garden, long days of hunger-inducing farm work, not much time to cook, and a really annoying heat wave? Three batches of this tasty tuna salad in the last ten days — and no sign of us tiring of it anytime soon. I created this simple yet satisfying recipe last year for NPR's Kitchen Window but never shared it here, and now I know why — I was waiting until I made it even better. It seemed a little odd to apply my More, More, More motto to one of my own recipes, but in this case it worked beautifully. This new greener version is better looking, better for you, and even better tasting. I've mentioned before that Swiss chard is one of my favorite vegetables. In fact, if I were allowed to grow only two things in my organic kitchen garden they would be tomatoes and Swiss chard. This nutrient-packed chameleon of the vegetable world comes in a variety of colors and is a superb, year-round stand-in for lettuce, spinach and celery. When the spinach is suffering from heatstroke or the lettuce is keeling over from frostbite, my hardy Swiss chard doesn't even flinch. It's also easy to grow from seed and does exceptionally well in containers. And if you grow your own Swiss chard, you'll be able to enjoy the young, tender leaves which are rarely available for sale. Swiss chard is bursting with nutrients, including vitamins K, A, C and E, plus several B vitamins, magnesium, manganese, potassium, iron and dietary fiber. It's a good source of calcium and contains promising cancer-fighting properties. Throughout history, various parts of the plant have been used to treat everything from ulcers to dandruff. But more importantly, it tastes delicious. Peak season in most areas is from June through October, though in milder climates you often can find interesting varieties of just-harvested bounty at farmers' markets from early spring until late fall. Look for crisp stalks with shiny, unblemished leaves. One of the best things about Swiss chard is that it's actually two crops in one — the crunchy stalks can be chopped up and used in place of celery in many recipes, which is especially nice since conventionally grown celery ranks number four on the Environmental Working Group's list of most contaminated produce. Choose colorful varieties of Swiss chard such as Pink Lipstick, Canary Yellow, and Orange Fantasia and you'll have some of the prettiest 'celery' around. Tuna salad is the kind of thing I like to keep on hand in the fridge for quick meals and easy snacks, especially during the summer months, and this twist on the old standby will tempt even the most overheated appetites. If you don't have any Swiss chard handy you could substitute another sturdy leafy green such as spinach, kale, cabbage, or even some finely chopped broccoli or kohlrabi leaves (talk about healthy) or collard greens. Lettuce wouldn't hold up, but a handful or two of arugula would add a snappy bite. This is one of those recipes that adapts easily to whatever you have on hand, so don't be afraid to be creative. Any type of olives would work — cracked green, oil cured, even the plain old canned black ones. Chopped purple onion in place of the scallions would be very nice. Some red cabbage would be tasty, and I almost tossed a shredded carrot into the latest batch. After taking these photos I did stir in a few handfuls of drained and rinsed organic kidney beans, which added protein and fiber and made this salad even more of a meal. If you have a chance, mix up your tuna salad and let it sit in the refrigerator at least a few hours before serving; it'll be even tastier. You can put it on sandwiches, stuff it into pita pockets, spread it on crackers, or serve it on a bed of lettuce. You could make baby sandwiches on Carrot Herb Rolls, Italian Olive Cheek Rolls, or Savory Cheese & Scallion Scones, or use Swiss chard leaves in place of tortillas to make easy low-carb tuna wraps. I often eat it straight from the bowl with a fork. Feeding a crowd? Just double the recipe. As always, I urge you to seek out local and organic ingredients whenever you can. Combine mayonnaise, dijon mustard, balsamic vinegar and olive brine in a medium bowl and mix well. Stir in olives, tuna, chopped Swiss chard stems and leaves, parsley, and scallions. Add salt and pepper to taste and more mayonnaise and/or vinegar if desired. Stir in kidney beans if using. Tuna salad will keep for three days in the refrigerator. You'll find links to all my sweet & savory Less Fuss, More Flavor recipes in the sidebar of the Farmgirl Fare homepage under Previous Posts: Food Stuff W/ Recipes. Enjoy! © Copyright 2008 FarmgirlFare.com, the award-winning blog where Farmgirl Susan shares recipes, stories, & photos from her crazy country life on 240 remote Missouri acres — and we feast on homegrown Swiss chard almost year round. I'm in a bit of a pickle. Actually it's more of an onion - scallions to be exact. I remembered to double plant my onion sets in the kitchen garden this year so I could thin them out and reap a bonus crop of spring scallions, and my plan worked beautifully. But despite my tossing extra scallions into pretty much everything except dessert for the last few days, I still have about 125 that really need to be harvested now. There are a zillion recipes that include scallions - which are also called green onions - but these mild and tasty alliums never seem to be the star of the show. I thought I remembered seeing a delicious sounding recipe somewhere for stir-fried scallions (maybe with a teriyaki sauce? ), but a quick online search resulted in lots of stir-fried things with scallions added to them, but no recipe for just the scallions themselves. When I reported my scallion situation to my foodie pal Beth (aka kitchenMage), she suggested I toss a pile of them with some olive oil and then slow roast them in the oven at about 325° with some thinly sliced garlic. I haven't tried this yet, but I think the idea it has serious possibilities. When green onions begin to form bulbs they're called spring onions, or sometimes salad onions. I have plenty of those, too. So what would you do if you were faced with an enormous quantity of gorgeous scallions and spring onions? While I'd love to know any of your favorite ways to use them, I'm particularly interested in recipes that call for large quantities, like 10 - or even 40. You're welcome to leave recipe links from your own blog in the comments section. Thanks for the help! Oh, and because I'm so desperate, I'm posting this plea on my kitchen garden blog as well, so if you're looking for more fresh scallion ideas (or want to see what they look like while still in the ground) check the comments section of Garden Journal Entry 6/7/08: What To Do with 125 Scallions?, which also includes links to some of my posts about growing your own onions. Up next on Farmgirl Fare (well, probably after a Daily Dose of Cute or two) I'll be sharing my recipe for Swiss Chard Tuna Salad, a refreshing twist on the classic standby that calls for a healthy dose of Swiss Chard (one of the best vegetables you can grow from seed) along with plenty of scallions. © FarmgirlFare.com, the onion loving foodie farm blog where Farmgirl Susan shares stories & photos of her crazy country life on 240 remote Missouri acres - and we're always thrilled when there's an overabundance of food in the garden, even if we're not always sure what to do with it. Eager Anticipation - The Water Tank Has Arrived! © Copyright 2008 FarmgirlFare.com, the award-winning blog where pool season has officially begun - and the poor, disgusted, decidedly non-swimming sheep are now being forced to drink contaminated dog water.